Zippy’s is launching a collaborative line of T-shirts, tote bags, and stickers with the popular local boutique 88 Tees. This will be Zippy’s fourth cooperative effort in the past two years creating limited edition products with local brands and designers, the past partnerships being with Fitted, Jasper Wong, and In4mation. The merchandise, which will be released on April 1, will be available for purchase until supplies last through the end of May. The design for the 88 Tees collaboration was inspired by saimin, Hawaii’s version of ramen. The iconic characters Yaya and Kuku from 88 Tees are sharing a bowl of the popular local noodles in soup, a meal originally inspired by Japanese ramen, Chinese mein, and Filipino pancit during Hawaii’s plantation era. Men’s and women’s T-shirts will be priced at $29.99 and are available in sizes ranging from S to XL. Tote bags and bumper stickers will be sold for $19.00 and $5.00, respectively. 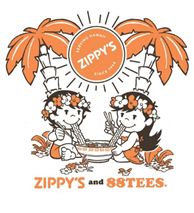 All merchandise will be available for sale at 88 Tees, with a limited number of T-shirts and tote bags available for purchase online at zippys.com. To inaugurate the new partnership, there will be a pop-up store in the Kapahulu location on April 3, 2019, from 4:00 to 7:00 p.m., featuring a meet-and-greet with the daughter of the owner of 88 Tees, Avian Ku, who was also a former cast member on the Netflix TV series “Terrace House,” a Japanese reality show that documented the lives of six strangers living under the same roof in Hawaii.